Two down and one more to go. The New England Patriots are the AFC champions for the third time in four years. We are going to the Super Bowl LII! It was a great game - close and down to the wire. How else would the Pats play it? We beat the Jacksonville Jaguars 24-20. A lot of good plays on both sides of the ball, I feel we were most fortunate to come out on top. 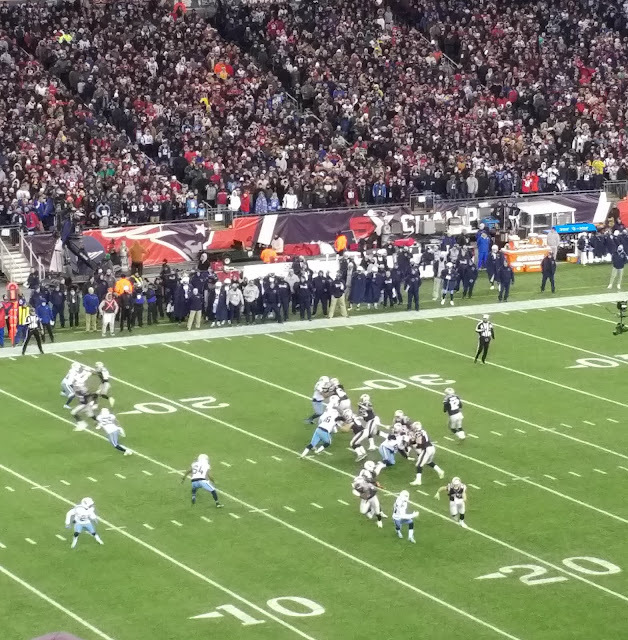 Tom Brady had an injured right hand, but it was hard to tell as he made some very good passes. 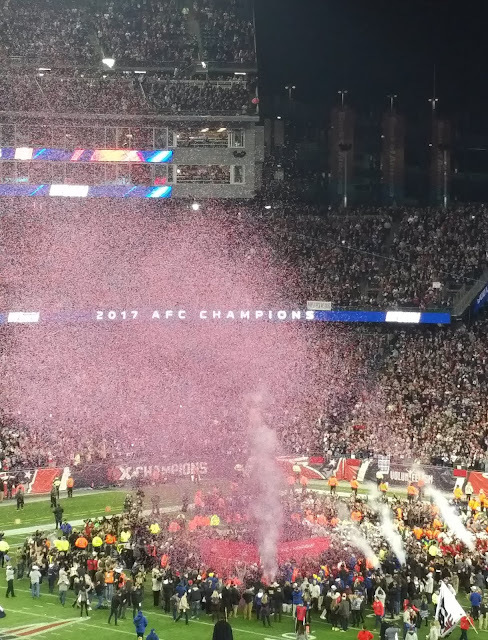 And for us fans, the weather was mild and we were not freezing like we were last week when we beat the Titans to advance to the AFC championship game. This is Willie McGinest, a fan favorite. 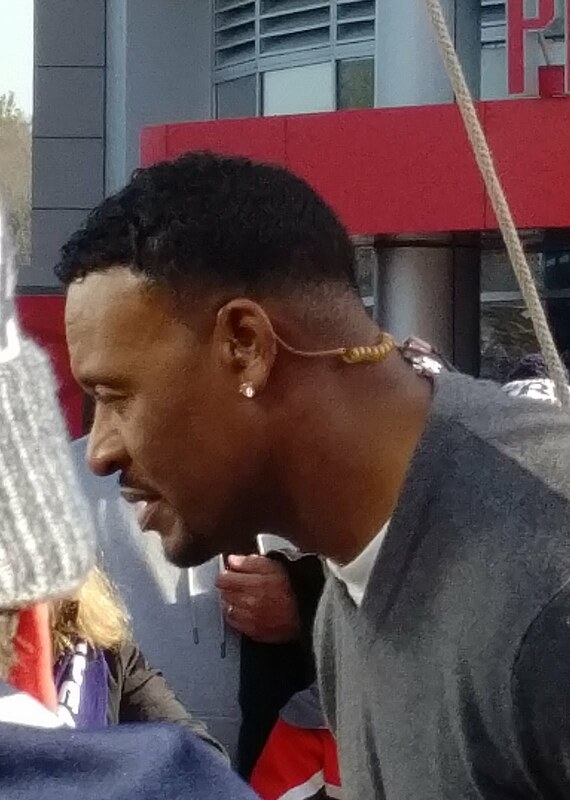 He was a linebacker for the Patriots from 1994 until 2006. 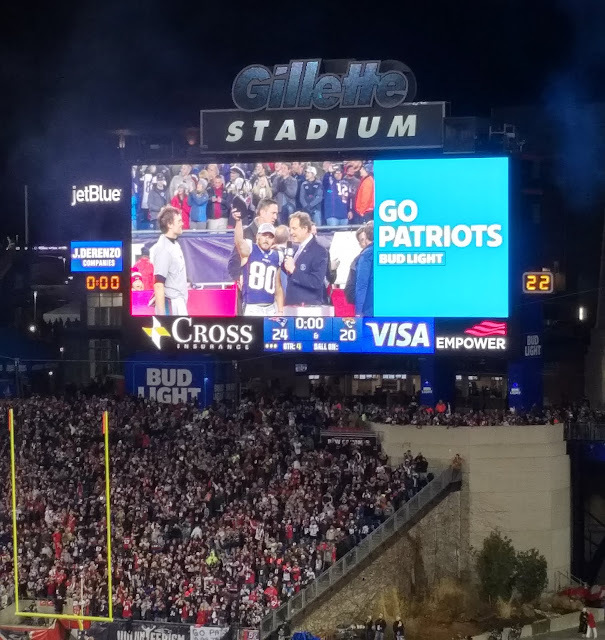 He makes many return appearances to Gillette Stadium and the crowd loves him. Maurice ( I did not catch his last name) was a former running back with Jacksonville and also well loved by his team and fans. Willie and Maurice gave a brief interview together outside of the stadium before the game started. He was nice and posed for pictures with many Jacksonville fans. 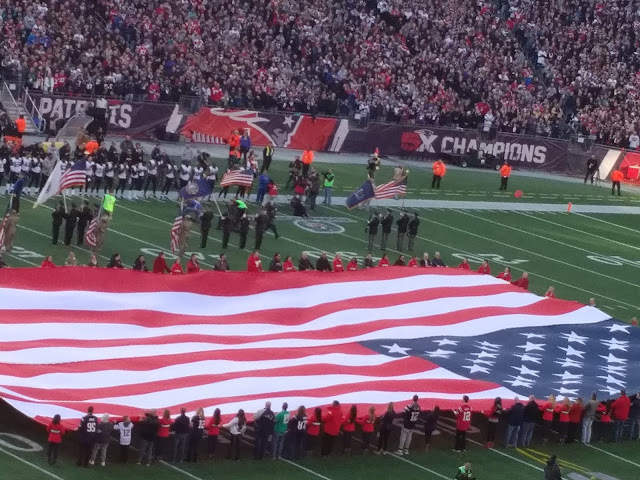 The flag of the USA during the singing of the National Anthem. 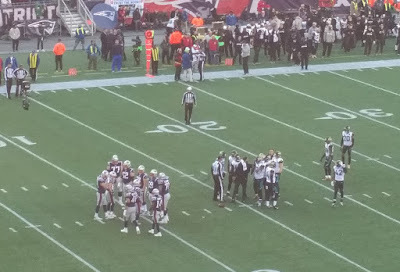 New England Patriots win 24 - 20 over the Jacksonville Jaguars. Danny Amendola scored two touchdowns. 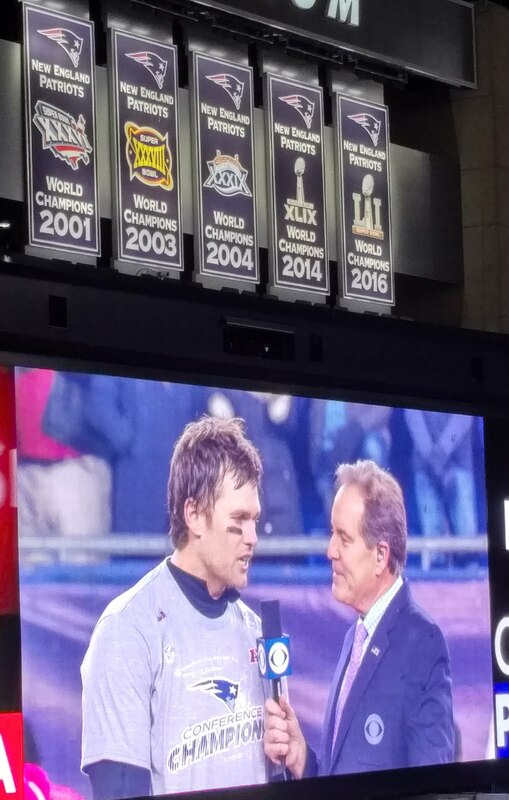 He is on stage with TB12. 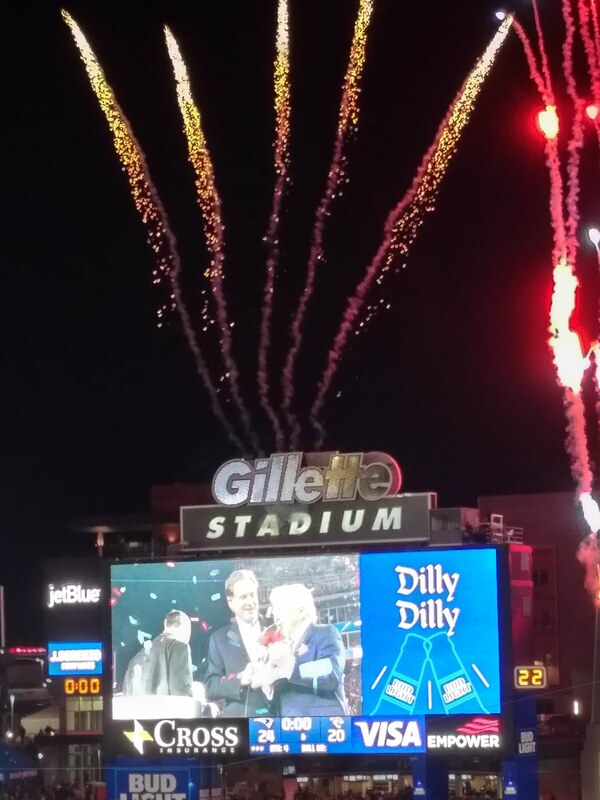 Mr. Robert Kraft, the owner of the Patriots receives the trophy. He bought the team 24 years ago (1994) and has been to the Super Bowl as team owner 8 times, this year will be the 9th. In total the Patriots will have been to the Super Bowl 10 times, eight trips for the Belichick/Brady team. They are working on their 6th victory. Blitz for six. NOT DONE is the mantra this post-season. Do Your Job is every season. Our quarterback, Tom Brady, number 12. And we are off to Minnesota for Super Bowl LII. Sorry I am not in the "we", but will watch from the comfort of my couch in my living room! 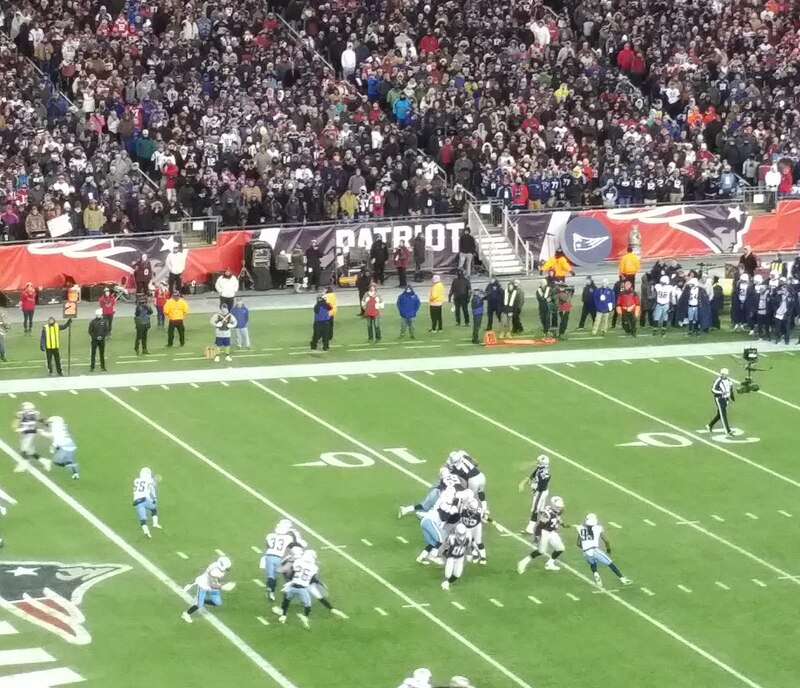 It's Football playoff season and the New England Patriots won their division game 35-14 over the Tennessee Titans. They now proceed to the AFC Championship game next week against the winner of the Pittsburgh/Jacksonville game today. If victorious, then it is off to the Super Bowl. If not, they all go home and prepare for next season! It was bitter cold and I toughed it out. Hope it is a little warmer next week! 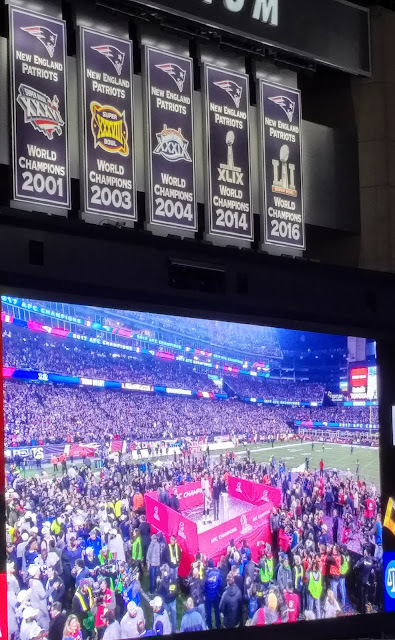 Here are a few pictures taken from the stands at the game. 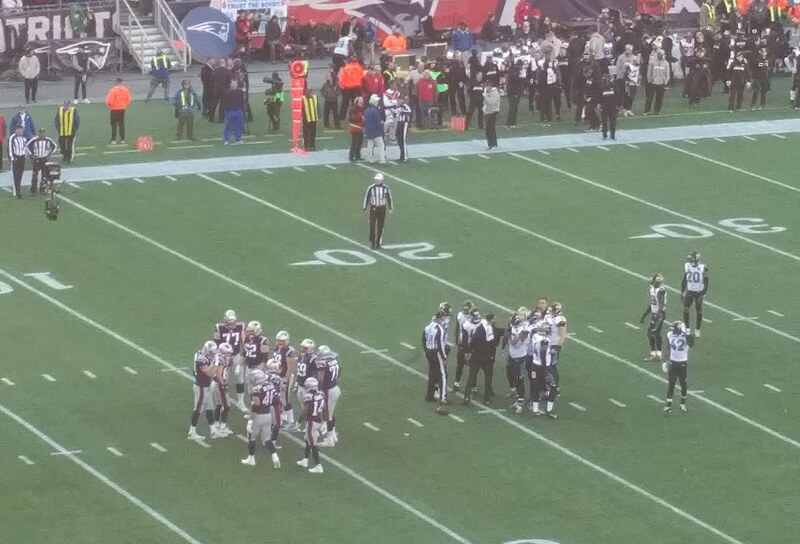 Tom Brady threw a TD pass to Gronkowski. They were disappointed that they did not get to watch the game, Left them home to keep an eye on things. What a day! We started the morning opening with a run outside when it started to snow. And snow, and snow. We had a major storm today, a nor'easter, a blizzard, or in other words - a bomb cyclone! The meteorologist have recently been using new terms on the general public. Must be boring to call yet another snowstorm a snowstorm. At the end of the day we had 18 inches of white fluffy flakes and 78 mile and hour wind on the Cape (here we had gusts of 40+ mph so far) and strong winds, hence the term cyclone in the description of today's storm. Bombogenesis, a popular term used by meteorologists,occurs when a midlatitude cyclone rapidly intensifies, dropping at least 24 millibars over 24 hours. A millibar measures atmospheric pressure. This can happen when a cold air mass collides with a warm air mass, such as air over warm ocean waters. The formation of this rapidly strengthening weather system is a process called bombogenesis, which creates what is known as a bomb cyclone. So we just are ending now with our winter cyclone or hurricane. I had to shovel a couple of times and will do one more time before I leave for work tomorrow. Took advantage of being at home and took down three of the Christmas trees. One more to go but I am keeping it up for the Feast of the Three Kings. Would have left the others up but decided to take advantage of the free time as it takes forever to put all of the ornaments back. Then spent a few hours shoveling near the end of the storm. I still have more to do, and tomorrow is to be bitter cold, but eventually I will get it done. Or else there will be another storm and more snow and I'll sort it all out then! 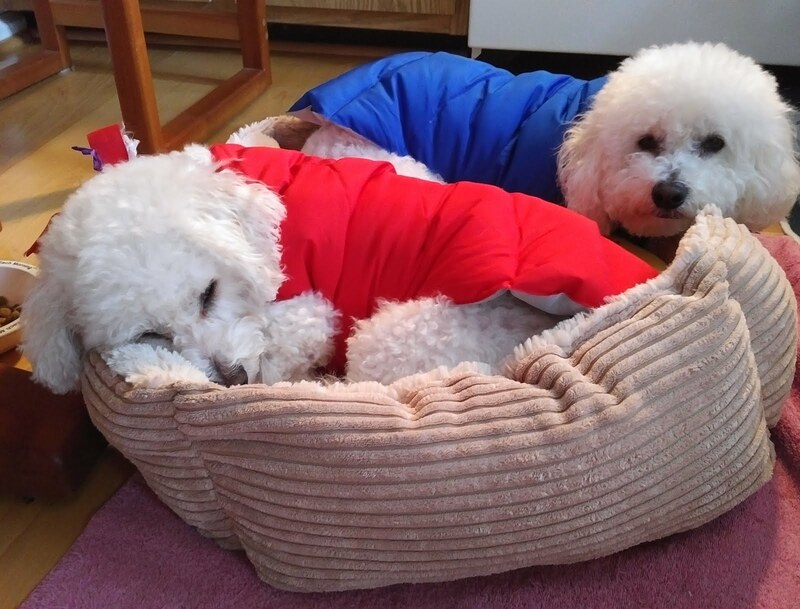 Had ordered Shorty a "puffer" which is an insulated dog vest. He still wants to go outside even in the bitter cold so I am trying to keep him as warm as possible. When I took it out of the package and told him it was his, he came right over and let me dress him. Then he gave me many, many puppy kisses. There is definitely a canine response to kindness and Shorty is very affectionate and demonstrative in showing his joy in receiving something special. 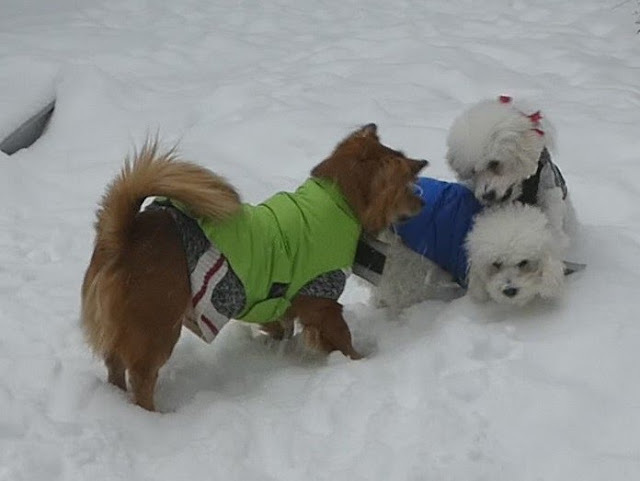 So this morning I dressed all three in their new puffers - Gunnarr got one I originally bought for Shorty but it was too small and Fionn got a new one but it is too big! Sizes do not seem to carry from one brand to another. So the boys wear a sweater under their puffer and Fionn wears too puffers - one from last year that is just a touch small and one from this year that is a touch too big! 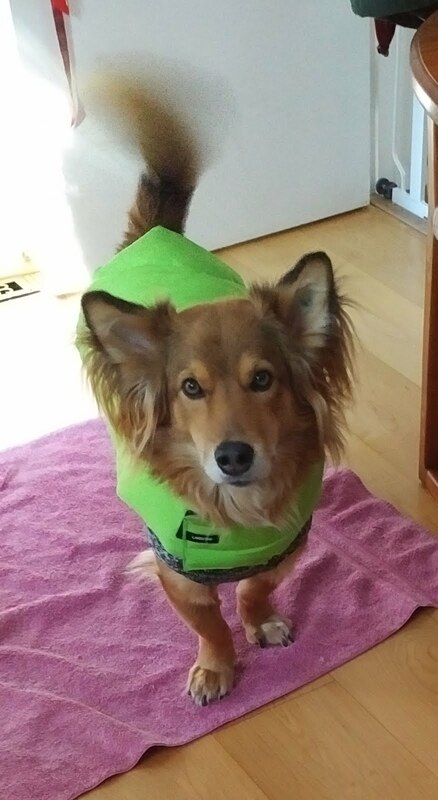 It all works and now when Shorty wants to go outside I call out come get your sweater and he lets me put the sweater and puffer on him without a fuss! Good boy. Everyone lines up to get dressed. Then off they go, running and playing out in the snow! Here are a few pictures from today, some taken at the beginning of the snow and a few at the midpoint. Hope you enjoy them! Shorty in his new puffer. He is so proud of his new vest! Good thing the puffers are bright colors! Gunnarr was really happy jumping and running the fluffy snow! He is such a gem and very affectionate and protective of me. 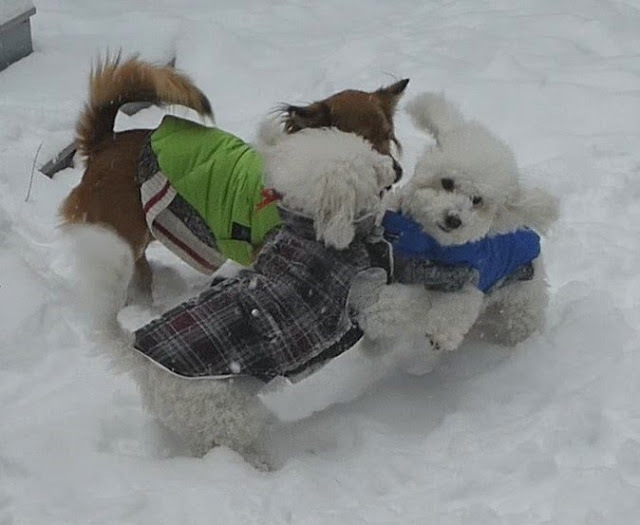 The three musketeers playing and jumping on each other. Good brothers. Fionn looks so cute. He has such energy and expressiveness and is a true delight. 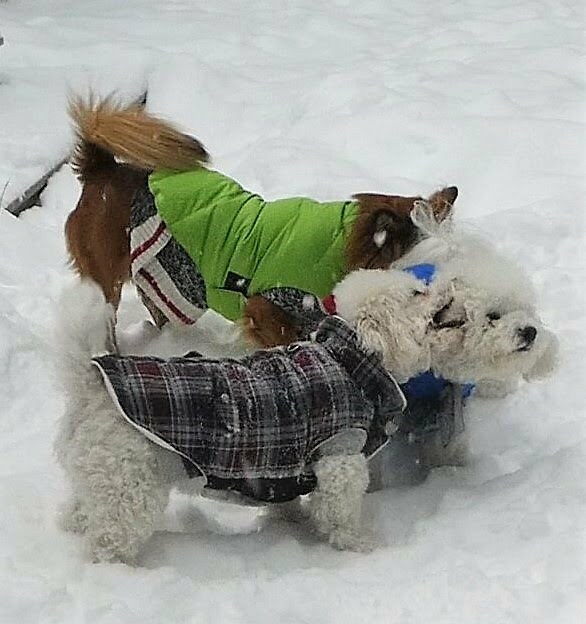 Here Shorty takes a brake from wrestling to rolling in the snow. He has adapted to the cold and snow far better than I could have ever imagined. My little Yapese dog! Momma - where are you? Let us back inside! All three are looking to get inside the warm house. It is still snowing the wind is blowing. And I am trying to get ready to shovel the driveway and sidewalk and porches. This is what you do when you come inside after running and jumping and playing in the snow. You take a nap! Shorty likes the guest room and often stands by the gate to indicate that he would like inside. Then he jumps up to sleep on the bed nestling my warm, soft robe. Plans to go to Boston's First Night went out the door with the frigid Arctic freeze that has enveloped our area for over a week. I enjoy seeing the ice sculptures and especially the fireworks at midnight, so I was disappointed not to have bundled up for the evening. Not this year, I cuddled up in the couch and kept warm! I will admit that I whimped out when I saw the temperature at my house was -2F. It dropped to -6F this morning when we awoke. I am clearly not a polar bear! While the furnace ran all night, at least it did not go out as it did two nights ago. Today was a relaxing day. I cleared many ice dams from the gutters while Fionnegan, Gunnarr and Shorty ran and chased each other around the yard. Despite the bitter cold, Shorty does not seem to mind. He often indicates he wants to go out and is pretty good at allowing me to put a sweater on him. I think he wants to be just like Fionn and Gunnarr so he puts on the sweater after just a brief chase today. The holidays have also been a time for me to cook - something I am not very good at doing nor do I have enough time to cook nice meals. So we all probably gained a few months these past couple of weeks. I have enjoyed the holidays with the change of pace. 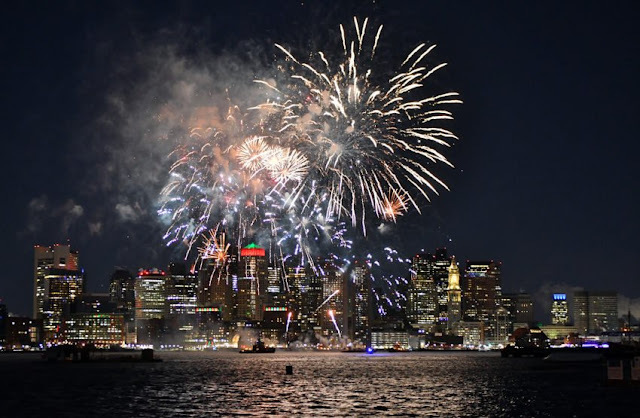 Photo from Boston Globe: First night fireworks. Couch potatoes! All three were out cold watching the Patriots football game. We are now awaiting the playoffs and hoping that our New England Patriots do well. By that we mean win. The Super Bowl. Again. But we will not jinx them. We are happy to take it one game at a time. Just win. All of them. He is having a blast! Runs and rolls and sniffs the snow. There is no keeping him inside the house! Ice encrusted all of my trees and shrubs and most are still bent and attached to the ground. Must let them lift on their own or else the branches will break. The sun today gently warmed even though it only reached 12F. A heat wave during the afternoon! This is Fionn in red. Sharing jackets is key to staying warm. Shorty is one handsome dog. Hard to believe he was born in the tropics. Hope you are having a very good start to 2018!